Praised for “…spot-on ensemble playing and a beautifully blended sound…” (San Francisco Classical Voice) and “…rich, committed string tone, dazzling pianism, rhythmic flexibility, and risky tempi…” (Sarasota Herald Tribune) the Delphi Trio has become a powerfully eloquent voice in the world of chamber music. Prizewinners of the 2015 Orlando Concours, the Delphi Trio performed throughout the region to great acclaim, including a live broadcast for Dutch Radio 4. 2016-2017 season highlights include the world premiere of William Bolcom’s Piano Trio, an evening of solo concerti by Schumann, Bernstein, and Shostakovich with the San Jose Chamber Orchestra and Barbara Day Turner, a recording project with indie rock artist John Van der Slice and composer Max Stoffregen, and the west coast premiere of Paul Juon’s Episodes Concertantes (1912) with Michael Morgan and the Oakland Symphony. 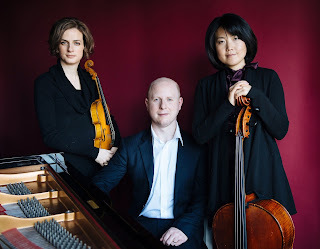 The Delphi Trio is grounded in the immensely rich classic repertoire for piano trio and is committed to the exploration of its deep, lasting meaning for performers and audience alike. The Trio sees contemporary music as a natural extension of the standard repertoire and is dedicated to the music of our time. Championing works by Henry Cowell, Pierre Jalbert, and Joan Tower, Delphi has given acclaimed world premieres of Max Stoffregen’s Coyote Plan (2013) and Sahba Aminikia’s Deltangi-ha (2012) and Shab o Meh (2014). The Trio has commissioned William Bolcom to write his first piano trio, to be premiered during the 2015-2016 season. The Delphi Trio believes chamber music is an ideal model for education. As faculty of the Crowden School’s Summer Chamber Music Workshops, the Trio regularly coaches and mentors musicians of all ages. Delphi is committed to supporting young artists as they begin their careers and have established the Emerging Artist Program to guide collegiate students through their first independent public concertizing experience. In addition to their work as a trio, Jeffrey, Liana, and Michelle perform in solo recital, larger chamber music, and as soloists with orchestra and believe in the symbiotic relationship between solo and collaborative work. They have individually performed with artists such as Robert Mann, Bonnie Hampton, Anthony Marwood, Menahem Pressler, Geoff Nutall, and Paul Katz. Liana Bérubé, Michelle Kwon, and Jeffrey LaDeur are graduates of the University of Toronto, Stanford University and the Eastman School of Music respectively, and formed the Trio while studying in the prestigious Chamber Music Program at the San Francisco Conservatory of Music. They count among their mentors Henk Guittart, Bonnie Hampton, the St. Lawrence Quartet, and Stephen Prutsman, and have worked with Peter Wiley, Pedja Muzijevich, and Pamela Frank. As an ensemble, the Trio has always made food and friendship a priority and believe that these elements are at the heart of great chamber music. The ensemble is built on trust and communication; to that end, each Delphi rehearsal starts in the same way: a meal, conversation, and music.